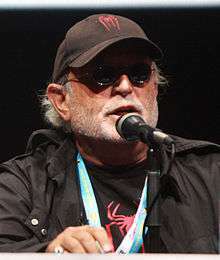 Avi Arad (Hebrew: אבי ארד‎‎; born August 1, 1948) is an Israeli-American businessman. He became the CEO of the company Toy Biz in the 1990s, and soon afterward became the chief creative officer of Marvel Entertainment, a Marvel director, and the chairman, CEO, and founder of Marvel Studios. Arad was born in Israel, to Holocaust survivors from Poland. He spent his childhood in Israel, and grew up on Superman and Spider-Man comics translated into Hebrew. In 1965, he was conscripted into the Israel Defense Forces (IDF). He fought in and was wounded in the 1967 Six-Day War, and spent 15 days recuperating. Arad finished his military service in 1968. In 1970, Arad moved to the United States and enrolled at Hofstra University to study industrial management. He worked as a truck driver and Hebrew teacher to put himself through college, and graduated with a BBA in 1972. Along with Israeli-American Toy Biz co-owner Isaac Perlmutter, Avi Arad came into conflict with Carl Icahn and Ron Perelman over control of Marvel Comics in the wake of its 1996 bankruptcy. In the end, Arad and Perlmutter came out on top, with Toy Biz taking over Marvel Comics in a complicated deal that included obtaining the rights to Spider-Man and other superheroes that Marvel had sold earlier. He was involved in Marvel's emergence from bankruptcy and the expansion of the company's profile through licensing and movies. On May 31, 2006, Arad resigned his various Marvel positions, including his leadership of Marvel Studios to form his own production company, Arad Productions. Although he is still producing projects for Marvel, his first feature outside Marvel was the August 2007 film Bratz: The Movie. Future ventures include: an adaptation of the manga Ghost in the Shell; an adaption of Brandon Mull's best-seller teenage fantasy, Fablehaven; an adaption of James Patterson's award winning teenage novel Maximum Ride; the adaptations of two Sony PlayStation properties, Uncharted and inFAMOUS;, and an adaptation of Hideo Kojima's video game Metal Gear Solid. On August 25, 2010, it was announced that Arad was given a chair with the American branch of animation studio Production I.G in Los Angeles, California. 1 2 Bowles, Scott (June 5, 2003). "Marvel's chief: A force outside, 'a kid inside'". USA Today. ↑ Hofstra University: Frank G. Zarb School of Business - Faces of Success: Avi Arad '72 Archived May 17, 2008, at the Wayback Machine. ↑ Fernandez, Jay A. (28 July 2009). "Scribe takes on 'inFAMOUS'". The Hollywood Reporter. Nielsen Business Media. Archived from the original on 30 July 2009. Retrieved 30 July 2009. Avi Arad and Ari Arad will produce. ↑ Wales, George (30 August 2012). "'Metal Gear Solid' movie confirmed". Total Film. Future Publishing Limited. ↑ "Spider-Man Producer Avi Arad Becomes I.G. USA Chair". Anime News Network. Anime News Network. 25 August 2010. Archived from the original on 27 August 2010. Retrieved 30 August 2010.